In Stock. Ships Directly to You. 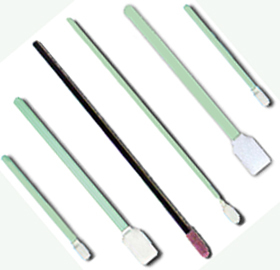 Our Wide Variety of Multi-Purpose, Durable Industrial Foam & Polyester Swabs. Great Prices! Highest quality swabs! Superb cleaning properties. Lint free. Non-abrasive. Shed-resistant. Swabs exceed industry standards. Handle & head thermally bonded. Compatible with most solvents. Ideal for clean room, electronic, industrial, audio-visual, micro optics and your general cleaning tasks. Can't decide? Here's our helpful Variety Pack of all 11 swab styles (foam & polyester) so you can figure out what's best for your own applications. Gentle for Delicate Surfaces and Endless Applications: Our swabs are used in a broad range of utilities from cleaning delicate CD's and disk drives to cleaning printed circuit board (PCB) assemblies during prototyping and rework by electronics designers and technicians to all the many applications shown in the photos above. Wide Selection: Our large variety of swabs include open and closed cell polyurethane foam and also knitted polyester as shown above. Our swabs offer many distinct application tips from budded and spear tips to the larger paddle designs. Nearly Two Decades of Marketing Swabs: Zephyrtronics has been marketing our premium foam and knitted polyester swabs for nearly two decades. At times we have hundreds of thousands "in stock" here in Los Angeles ready to ship to you. Durable With Excellent Cleaning Capacity: Our foam swabs have superb cleaning properties and many advantages over cotton swabs. The handles of all our swabs are ESD-safe and thermally bonded to the swab head helping prevent unwanted separation during use. Thermal bonding also eliminates the use of contaminating adhesives and coatings and sprays. Free from silicones, amides and DOP, our swabs are compatible with many solvents and alcohol cleaners and some are compatible with acetone as well. 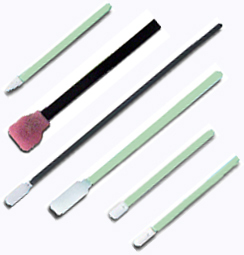 Our swabs are excellent for hard to reach cleaning and picking up dust. Thermal-bonded swab heads for rigorous scrubbing.